← Refuge – education center for wildlife. 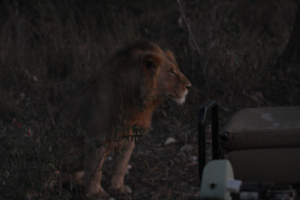 Lion’s are more unpredictable at night and it’s getting darker! We arrive just on dusk. There are 3 lions sleeping and relaxed. As the truck eases forward some raise their heads and scan the new arrivals. Most are disinterested and some just lay back down. One lioness stares intently and it appears to be at me!On arrival at the research centre all volunteers receive a briefing on the threat posed by the various dangerous creatures we may encounter. It works through an extensive list from spiders with flesh eating venom, lethal snakes, a range of predators and on to elephants. Many of these have made appearances in and around the both bush camp or the research centre and neither of these are fenced. Some in unusual circumstances, like the spitting cobra that emerged from the drain hole between the feet of a volunteer! Or the pride of 5 lions that one night decided to hang out under the eaves that ‘shelter’ the doors of the volunteers sleeping quarters. The briefing on animals includes graphics of the threat level relative to distance from them. The critical distance varied but 20- 30 meters is too close and the time required to cross the critical distance was seconds. Our encounters to come in the back of a 4WD, if on foot, would put us within lethal distance. Placing my faith in the trackers – guides assurances that they see an open 4 WD loaded with people as a single unit and too big to tackle. Lion also see us with our forward facing eyes as a fellow predator and to be respected. I’m relaxed but with an underlying unease under her gaze. But be warned its ‘very dangerous’ if you: stand up, raise your hands, move quickly, put or wave a limb out side the vehicle. Get out and you have a life expectancy of seconds. We are also told that as the sun sets the predators are bolder and have excellent night vision. The lioness’s stare is still locked on me! As the sun sets and the light fades she stands and walks directly towards me with her eyes locked on my face. She shows no sign of fear but is very ‘interested’ in me! Maybe it’s that I’m the oldest or she has already assessed my running ability but I have no doubt I’m the center of her attention. She gets to within 2 meters of the 4WD and turns to go around the back with one long menacing look as she passes. I turned to the back of the 4WD and leaned out in anticipation of her reappearance in the failing light. Her face eases out from immediately behind the 4WD. Our eyes meet again in locked stares. My underlying unease starts to assert its self. I have no doubts she is assessing her chances of an attack from behind. My mind retrieves the one unit – too big assurances, don’t stick body parts out of the vehicle and the they get bolder as the sun sets and try to asses the relative balance. I withdraw my head!The seconds pass and I glance again, she has not moved and her stares assume a greater malevolence. I again with draw my head. The darkness now closes in and the other lions start to stir. Another glance behind, her yellow eyes x-ray my organs. I again withdraw. The other lions stir and move of to hunt. I look behind again. She returns my stairs, no fear just calculating her chances. The seconds pass slowly she turns to follow her companions. I have survived our encounter due to the flimsy barrier of my lions flawed risk assessment. I have since returned to my memories of the event and contemplated what factors may have shifted the balance. Has hunting been difficult or if she was injured and desperate for food. Would this have changed the out come? Possibly. There are many 4WD’s full of tourists repeating these encounters every day and probability says the balance of each the lions calculations varies. Because of this the brain searing memory of the event will last a lifetime. 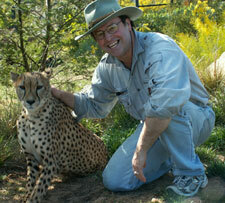 This entry was posted in Africa, Makalali, South Africa, Wildlife. Bookmark the permalink. Ask yourself would a double cheeseburger go wanderin round the bush??? ?